Discussion in 'Bangladesh Defence Forum' started by Homo Sapiens, Dec 6, 2018. 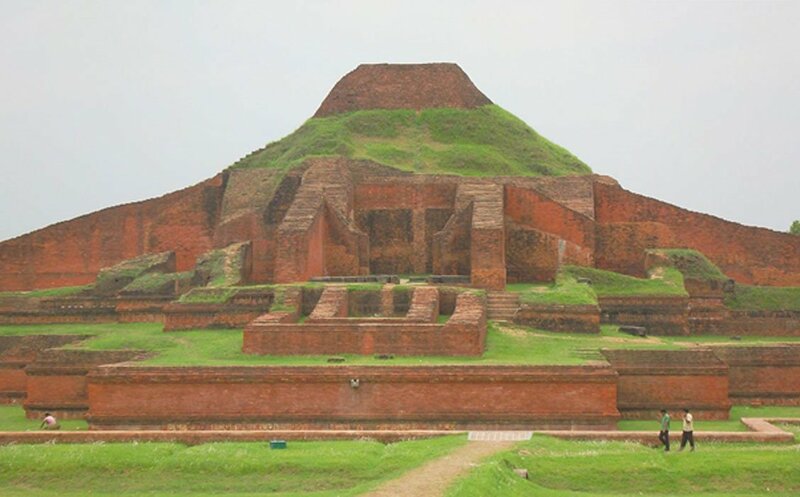 Somapura Mahavihara is an 8th century Buddhist monastery and an important archaeological site located in Paharpur, Bangladesh. It is one of the five great mahaviharas, (meaning great vihara or large monastery) which were established in ancient Bengal during the Pala period. All were interlinked to form a network, and Somapura Mahavihara is the largest amongst these ancient Buddhist establishments. It is also one of the best known Buddhist monasteries in the Indian subcontinent with the complex covering more than 20 acres (85,000 square meters). With its simple, harmonious lines and its profusion of carved decoration, it influenced Buddhist architecture as far away as Cambodia. The Somapura Mahavihara is important to the three major historical religions in the region, serving as a center for Jains, Hindus, and Buddhists. The structure of the complex is quadrangular and the elaborate entrance to the vihara lies on the northern side of the complex. Each of the four sides is 922 feet (281 meters) long, built around a massive inner courtyard that houses a large number of shrines and stupas of different shapes and sizes along with terracotta plaques, inscriptions, ceramics, coins and stone sculptures. The outer walls of the monastery are formed by 177 cells that face inwards toward the main shrine at the center of the courtyard. The central shrine has a cruciform ground plan and a terraced superstructure that rises in three terraces to a height of about 70 feet (21 meters). At the base of the shrine, more than 60 stone sculptures depict a variety of Hindu divinities. The relationship between Indian and Southeast Asian architecture is evident - this is the only temple in the Indian subcontinent similar to those in Southeast Asia, where the style has become the standard. As found inscribed on a clay seal discovered in the compound, the first builder of the monastery was Dharmapala Vikramshila. The precise dates are unknown, but he reigned from approximately 770 AD for roughly 40 years. Dharmapala, the second ruler of the Pala Empire of Bengal , was the son and successor of Gopala, the founder of the Pala Dynasty who greatly expanded the boundaries of the empire, and made the Palas a dominant power in the northern and eastern India. Before Gopala ascended the throne as king, the region was in a state of anarchy with constant struggle between petty chieftains after the fall of King Shashanka. Gopala’s political authority was recognized without any struggle by several independent chiefs. Although there are many theories, the ethnic origins of the Pala dynasty are unknown, but what is clear is that the Pala period is considered one of the golden eras of history as they brought stability and prosperity to Bengal after centuries of civil war. They also advanced the achievements of the Bengali civilization and created outstanding works of art and architecture. The Palas were astute diplomats and military conquerors - their army was renowned for its vast war elephant corps while their navy performed both mercantile and defensive roles in the Bay of Bengal. Dharmapala Vikramshila was succeeded by his son Devapala who further expanded the empire and continued patronage of the Somapura Mahavihara. The monastery flourished until the 11th century when it suffered repeated attacks and was nearly burnt nearly to the ground by the Vanga army. A century later it was renovated and temple of Tara was added. Over the next centuries Somapura Mahavihara steadily declined and was more or less forgotten and abandoned. In 1919 it was proclaimed a protected archaeological site and excavations began four years later. Larger areas were uncovered over the next decades and work increased after independence. By the 1990s the site was at its current level of excavation. The collection of objects recovered from the area are housed in a small museum built in the 1950s as well as at the Varendra Research Museum at Rajshahi. The artifacts on display include terracotta plaques, images of gods and goddesses, pottery, coins, inscriptions, ornamental bricks, and other clay objects. Unsolved Mystery: Where did Hannibal get his War Elephants? Today Somapura Mahavihara is one of the prime tourist destinations in Bangladesh. The importance of this site has resulted in its being listed as a UNESCO World Heritage site because it represents a unique artistic achievement and due to the evidence it provides for the rise of Maharaja Buddhism in Bengal from the 7th century onwards. Great architecture from the Pala empire..
Bangladesh need to take immediate steps to restore this Mahavihara to it's entirety and original look. It will increase this sites appeal 10 times. It could become a great tourist attraction and cost of restoration could be easily recovered through tourism money. Excellent. As all of us (Except few who think their fore father came from Arebia) know that sub continent has a great cultural harritage and when it is explored, we find many such gems. This show that how developed the civilization was in that time when other part of the world used to live in Jungle. This is still the best buddhist structure in Bangladesh though. Also this should correct the misconception that most Muslim are hindu convert rather they were actually buddhist. And what were they before they became Buddhist? There are two options. Either they used to leave in caves before they became Buddhist or they were Hindus. You can choose whatever you like. Not restore but build one immediate to the original one. they did one in Moinamoti, not a replica but a new monastery for buddhist. No most of them were animist. This is not a indic architecture rather a burman type. This architecture is not like Buddust temple in Ancient Bengal. This is an example of burmese type of Pagoda located in Bandarban district. Built by Marma tribal people(closely related to burmese people). Built very recently in 2000 AD. This means they were Hindus. Miles apart.. they did not have caste system.. neither did they follow your customary deities. You do not have any idea of Hinduism. I recently visited two such monuments. Taj mahal and Akshardham of Delhi. Both will amaze you as soon as you see it. Akashardham is ven more impressive than Taj mahal. Itis a new wonder of of modern world. Sompura is also a cast who are master in designing and building these types monuments. The excellent temples build by Indians in recent times are designed by sompuras with their traditional knowledge of vastu shastra. Islamic Monuments in India - Whose Legacy?